An artist rendition of "Golden Tulip Sky Bay Gyeongpo"
On the strengths of his successful developments of the cities Chairman Shim Tae-Hyung of the Builder's Development Group has expanded his real estate businesses to the global hotel industry. In a recent interview with The Seoul Times held in his Seoul office the up and rising tycoon of real estate development revealed his plans for his hotel business and his achievements in vivrant South Korean real estate market. His first hotel project is "Golden Tulip Sky Bay Gyeongpo" in Gyeongpodae Beach in the eastern coastal city of Kangneung, Gwangwon Province, to be opened around the end of 2017. The majestic "Golden Tulip Sky Bay Gyeongpo" will be modeled after "Marina Bay Sands" resort in Singapore, according to Shim. Shim said that the 20-story five-star resort hotel will have a total of 538 rooms with full of state-of-the-art facilities. The luxury hotel will also be quipped with 400-seat banquet room, both indoor and out door pools, fitness centers, event halls, and other top-of-line facilities. "Above all our hotel is located right in front of the Gyeongpodae Beach where over six and a half million people visit," said Shim. 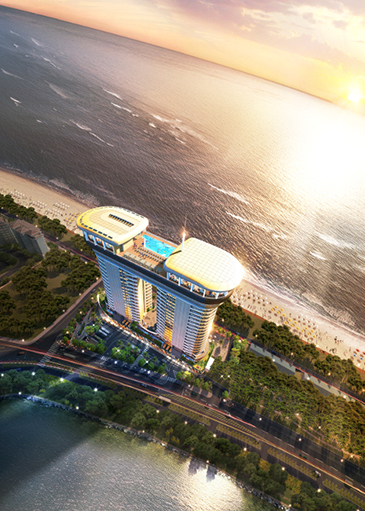 "'The Cruse Sky Pool' on the 20th floor will make our hotel a landmark in Gangneung City." Gangneung is the most famous and most popular resort city in the eastern coastal area in the nation. And the Gyeongpodae Beach boasts of cleanest sand quality in South Korea, attracting millions of both local and foreign visitors every summer. "However, most hotels and resorts in the area are aging and not modern enough to accommodate visitors and tourists," Shim explained. "I am sure that our hotel will satisfy the needs of the visitors." "Golden Tulip Sky Bay Gyeongpo" will be completed just in time for the 23rd Winter Olympics to be held in Pyongchang in the same Province of Gwangwon on Feb. 9, 2018 for the 25-day run. During the Olympics skating competitions including figure, short track, and ice hockey will be held in Gwangneung City. The city expects to have 40,000 tourists per day during the competitions. Currently, there is a great shortage in the number of hotels and condominiums in the city whereas at least 20,000 rooms are in need in the city for the Olympics. "So, our Golden Tulip Sky Bay Gyeongpo will play a big role in accommodating the local and foreign guests during the Olympics," Shim said. "Our most advanced facilities will satisfy them." In addition, a new KTX line between Seoul's Cheongryangri and Gangneung, now under construction, will also be completed within 2017. Also Gangneung City was declared as the "Tourist City of the Year" by the South Korean government. "All the supporting facilities including restaurants and cafes, saunas and massage shops in our hotel have already be rented out," Shim said. Shim added that "Golden Tulip Sky Bay Gyeongpo" will actually be run by Louvre Hotels Group of France, which has 1,200 hotels in 50 nations around the world. Chairman Shim Tae-Hyung (2nd from left) of the Builder's Development Group poses with his staff in his office in Seoul. At left is General Manager Jacob Yi and second from right is Regional Manager Lim Hyun-Bin of Sales & Marketing Division, and at right is Director Yoon Man-Sub of Finance Division. In actuality, Chairman Shim is just putting his firt step in the hotel industry. "Golden Tulip Sky Bay Gyeongpo" is his first project as hotel business. Shim revealed that a lot other hotels will soon be opened in other parts of the nation. But, he has made his success as a real estate developer, particularly in city development area. Shim spent nearly 40 years in this business. He purchased almost "obsolete" chunks of land in the provincial areas and built hundreds of apartment houses, turning the area into the golden land. Shim amassed a large fortune in this way. Repeatedly Shim turned almost abandoned areas into the wealthy commercial areas. He said that once gazing upon the land he instinctively recognizes the value of the land. Fast decision and drastic action are the secrets behind his huge success. Shim explained that he trudged nearly every nook and cranny of the country side for his real estate business. "Now I want to use my intuition and knowhow to other business," Shim said. "I also want to hit the jackpot in this hotel business." A devoted fan of soccer Shim is the vice chairman of the mighty Korea Football Association. 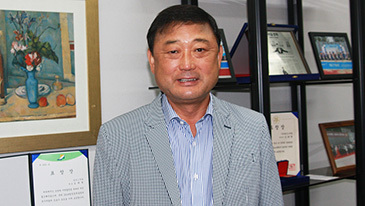 He also serves as vice chairman of the Korean Sport & Olympic Committee. 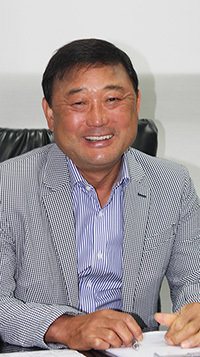 He served as chairman of Seoul Life Sports Association.